The cold halocline is a water layer within the Arctic Ocean that lies below the very fresh surface waters and above the saltier Atlantic layer. Where it is well developed, its low temperature serves to insulate the overlying sea ice from the heat residing in the Atlantic layer. The oceanographic term "halocline" refers to a layer of water across which there is a change in salinity. Its origin is Greek: "halo" from "hals" meaning salt, and "cline" from "klinein" meaning "to lean." In the Arctic seas, a halocline defines the transition between a fresher (i.e., less dense) upper layer and a saltier (i.e., more dense) lower layer. A related concept is "thermocline," which refers to a layer where there is a change in temperature. At the cold temperatures found in the Arctic seas, temperature plays little role in determining density. This means that warm, salty waters can lie underneath cold, fresh waters without the heat in the lower layer necessarily rising upwards. Such is the case in the Arctic Ocean. Below the surface layer, salinity increases downward but the temperature stays near the freezing point. This is the cold halocline. Actually, it is composed of several different layers, each originating in unique and only partly understood ways. The freshest (i.e., lightest) of these comes from various types of water that enter the Arctic Ocean through Bering Strait. In summer, the sun warms the water before it encounters the sea ice pack and flows under the cold surface layer. It retains some of this heat (up to perhaps 1°C above freezing) as it circulates through the Canadian Basin, although this heat usually dissipates in the vicinity of Lomonosov Ridge. This water can be divided further into a fresher layer that contains waters from the Yukon River and a saltier component that lacks this influence. The latter contains a relative abundance of dissolved chemical nutrients such as silica and nitrate, which come from the nutrient-rich North Pacific Ocean. Underneath this summer water resides a winter Bering Strait variety that is saltier and nearly freezing. It is even richer in dissolved chemical nutrients than the summer layer above it, since it picks up an additional load from bottom sediments as it moves northward across the very shallow Chukchi Sea. Below this layer lies the deepest halocline type, which probably forms in or just north of the Barents and Kara seas by a combination of several mechanisms. These include the cooling of salty Atlantic layer water and the salin-ization of cold continental shelf waters. Sea to its exit through Fram Strait into the Greenland Sea. 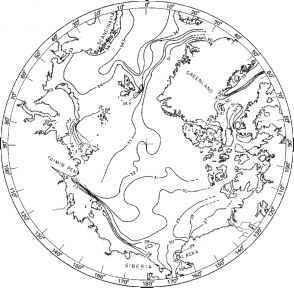 Its salinity is typically 34.8-35.0, and its temperature varies from about 3°C north of Svalbard to less than 0°C north of Canada. Since the freezing point of this water is about -1.8°C, even the coolest Atlantic layer water is a few degrees above freezing. Although this seems small, it represents enough heat to completely melt away the overlying sea ice pack if it were somehow able to mix up into the surface layer. The most vigorous source of mixing in the Arctic Ocean is generally from surface processes such as winds, sea ice motion, and the sinking of heavy waters formed by air cooling or sea ice growth. In the absence of a cold halocline, such processes might easily mix the Atlantic layer heat up into the surface layer and thus bring this heat into contact with the sea ice pack. This generally does not happen, however, because the halocline represents a stable barrier to surface mixing, that is, it is hard to penetrate this gradient in density. Even if the surface mixing were vigorous enough to penetrate into the halocline, it would only entrain water that is quite cool, and thus have little thermal effect on the sea ice pack. This inhibition of upward heat flux from the warm Atlantic layer is the main physical consequence of the cold halocline. Recent studies have shown that Arctic wind and surface air temperature patterns vary substantially on a multiyear time scale. These climate oscillations have affected the cold halocline by influencing where fresh surface waters circulate. In the late 1980s and early 1990s, an unusual wind pattern persisted that diverted river water away from the surface layer of the Amundsen Basin. This led to a retreat of the cold halo-cline from this area, leaving the surface layers directly exposed to the underlying warm Atlantic layer. This presumably is suppressed by the growth of wintertime sea ice in this area, but not for too long: the halocline began to rebuild as wind patterns shifted in the mid-1990s. If such climate oscillations persist or amplify in the future, then the Atlantic layer heat may play an increasing role in the ocean surface energy balance, that is, in keeping the sea ice pack thinner than it is now. This is the present situation in the Antarctic Ocean, which lacks a cold halocline and thus has a thinner sea ice pack that largely melts away every summer.